and manifesting the Mandala of Bright Virtue. is my own potential Wisdom and Power manifesting to me. as I contemplate my Inner Sage in my Middle Tan. 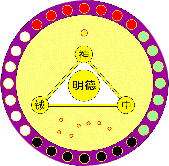 Numinous mind (Shen) links everything in profound unity. In the Six Degrees of Connectedness.